Turkmenistan and Uzbekistan are two of our favourite destinations. In this Grand Tour, we will explore some of the sites that are even more off the beaten track. We’ll see a truly amazing mix of Silk Road and Soviet histories as we explore both the main attractions and some of the more unique sites in these two fascinating Central Asian republics. In Uzbekistan, we will visit a still-working Soviet-built solar furnace and ride roller coasters at Tashkentland. 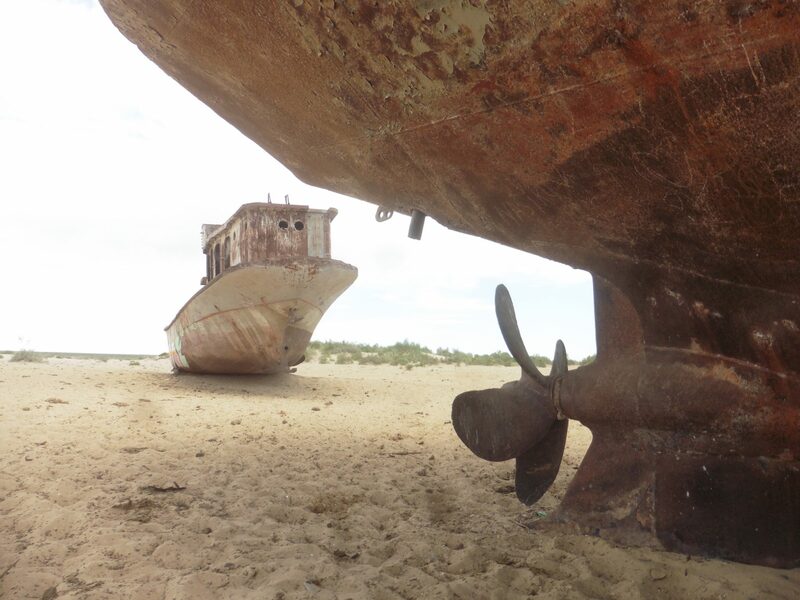 We’ll explore Yangiabad, a formerly closed Soviet town inhabited by exiled miners, and will peer into one of earth’s most infamous man-made natural disasters, the elusive Aral Sea. 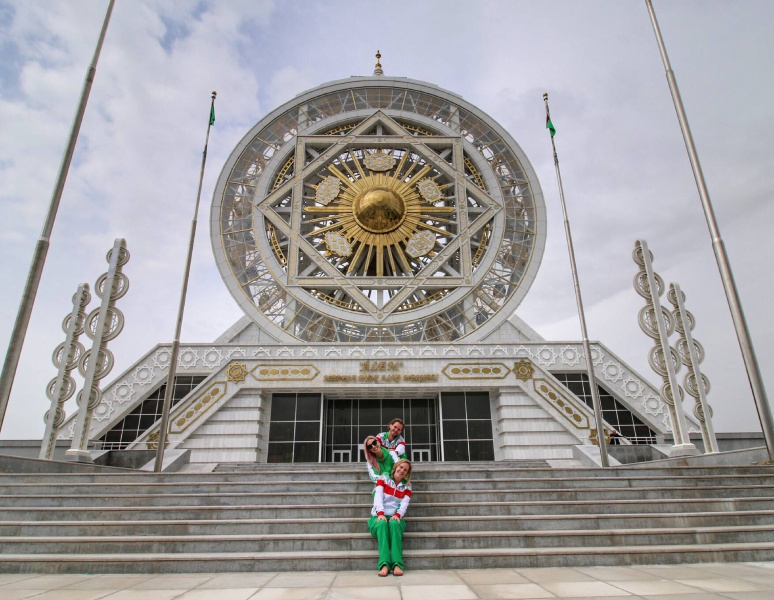 Continuing on to Turkmenistan, you’ll get to see the famous “White City” of Ashgabat, aptly name for its white marble facades, gold monuments and buildings with titles such as the “Wheel of Enlightenment” and the “Arch of Neutrality”. From Ashgabat we’ll take a drive through the Karakum Desert to the eternally burning fire crater known as the “Gates of Hell”, before visiting the futuristic ghost-town beach resort of Avaza and a canyon grander than the Grand Canyon, that even many Turkmens don’t know exist. After heading back to Ashgabat where Group A concludes, the tour will head east to Merv – the Silk Road city that was once the largest city in the world. Heading even further east into the remotest corner of Turkmenistan we’ll climb onto the largest repository of dinosaur footprints in the world, see a cave covered in cloth stalactites, take a natural mud bath and bend over for a goat massage. 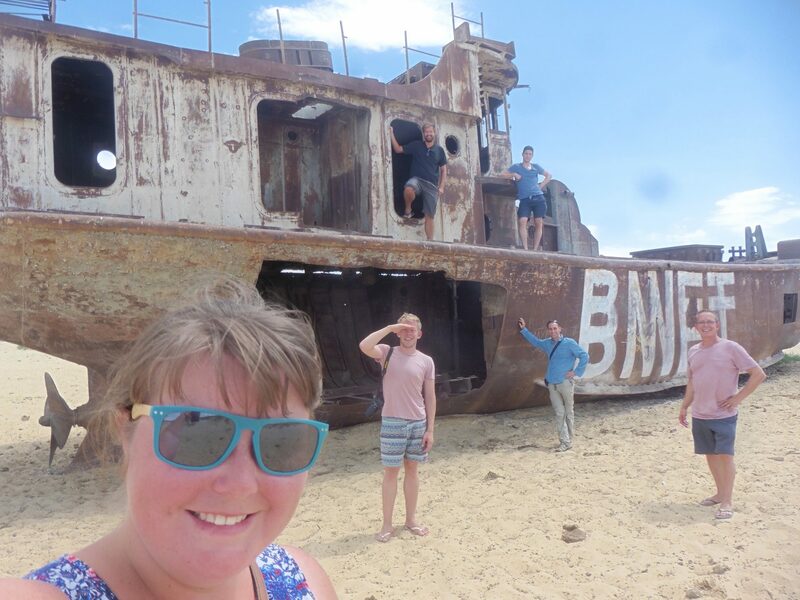 This tour is great for those who want to explore these amazing countries a little bit more in depth or for returners. 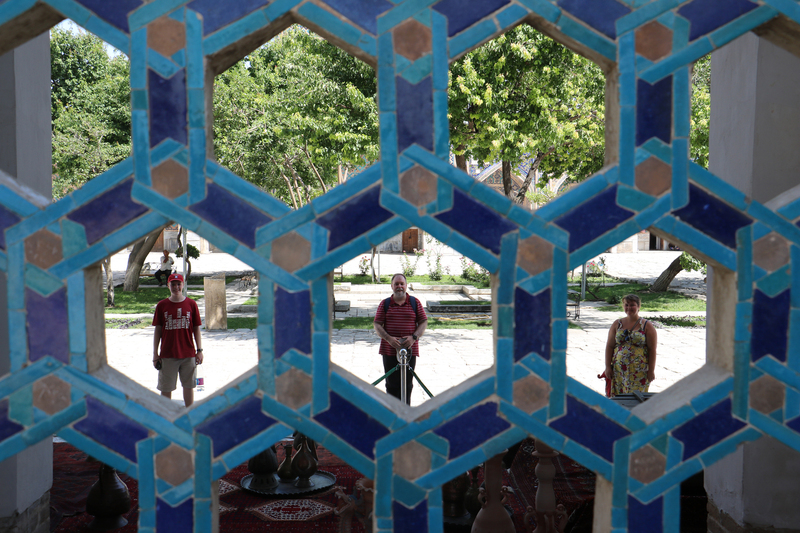 Visit Tashkent Land, Central Asia’s answer to Disneyland. With it’s faded welcome sign, crumbling gift shop and creaky rides, this is definitely a step back in time. Most tourists don’t make it to this gem of Soviet infrastructure, but we just can’t resist it. If you’re really game you can try out the “Boomerang” rollercoaster, or if you’d like something a bit more relaxing you can take a ride on the “African tour”, a boat trip through the jungleand. Next we’ll visit the Museum of Railway Techniques’. This outdoor museum is full of all sorts of old locomotives, and they don’t mind us climbing all over them. We can even take a little train ride around the train museum. You don’t have to be a train lover to enjoy this charming museum. Having died in September 2016, Islom Karimov, the First President of Uzbekistan, now has his mausoleum on the newly renamed Islom Karimov Street in the centre of the city, which of course we will visit. Winding through the narrow streets of the old city, we’ll stop at a particularly unique synagogue. Totally unrecognisable from the outside, it looks like any of the typical houses on either side, but inside is a bizarre and unique mixture of Uzbek and Jewish décor. Overnight train to Nukus leaving at around 7pm. Arriving at the main part of the sea, if you’re game, you can go for a swim. There used to be 10mg of salt per litre in the sea, but now with 160g (yes, grams, not miligrams) it’s not far off the Dead Sea (180g/l), and now you can easily float on top of the water. Cross the border into Turkmenistan. Visit the ruins of Konye Urgench. Drive to Dashoguz, for lunch and some free time before heading to the airport to fly to Ashgabat. 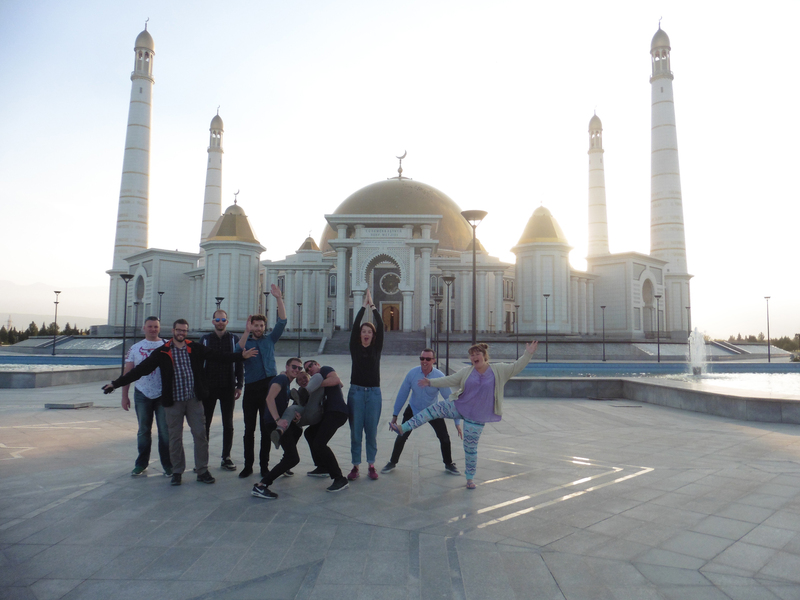 Meet those starting the tour in Turkmenistan. And another stop at the Altyn Asyr Sowda Merkezi, a new shopping centre in Independence Park which is in the shape of a pyramid, and the outside of which is covered in fountains and colourful lights. From the restaurant and viewing deck you’ll get 360 degree views of the city lights, whilst enjoying a nice cold draught beer. Dinner and drinks at a local pub in Old Ashgabat which serves shashlicks, kebabs and local draught beer. Approximately $8 pp. Spend the night at the Ak Altyn Hotel. Drive to the outskirts of Ashgabat to Nisa, a UNESCO site which was once the capital of the Parthian Empire. Next you’ll visit Kipchak to see the resplendent Turkmenbashy Mosque, where Turkmenbashy is buried beside his mother, father and two brothers in their white marble mausoleum. Continue on to Kow Ata. This natural underground thermal spring is said to have many medical attributes, but is also used by locals as a swimming hole and makes for a very fun and relaxing swim. Admission included. Drive 175km north west into the Kopetdag mountains to Nokhur, a traditional tribal village. Visit Nokhur Cemetery where each grave is adorned with the horns of a mountain goat. Dinner (included) and overnight in a homestay. Drive 450 km west to Avaza. 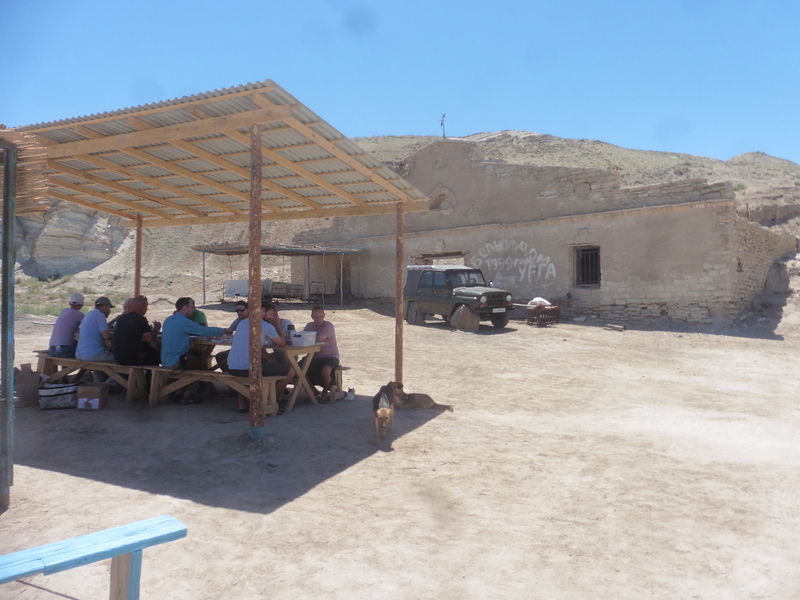 We’ll stop for lunch along the way at a local chaykhana. Approximately $2-5 pp. Arrive in Avaza and have a driving tour of the beach resort. Although the facilities are extravagant and the buildings futuristic, the town is somehow best described as a ghost town. Dinner in one of the glamorous hotels of Avaza. Approximately $10-12 pp. After dinner, we’ll take a walk along the coast of the Caspian Sea. Overnight in Turkmenbashy, a ten minute drive from Avaza. Yangykala Canyon. Many Turkmens don’t even know that this place exists, but once you’ve been there you’ll start calling the Grand Canyon the “Pretty Good Canyon”. In 4×4’s, we’ll drive over the canyon walls, through the canyon itself, and up the other side, to an excellent vantage point from where you will be able to see all the shapes and colours of this spectacular natural phenomenon. We will take a packed lunch with us so we can enjoy it at the canyons. You can either buy yourself something at the bazaar on the way, or we can organize a cooked lunch for $10 pp. Dinner at the hotel. Approximately $8-10 pp. Return to Ashgabat on Turkmenistan Airlines. Lunch at the Russian bazaar, where you can also buy some snacks, drinks and dinner for camping. Drive back towards Ashgabat, stopping at Tolkuchka Bazaar on the way, where you’ll be able to buy lunch, with some time to explore the largest bazaar in Central Asia (by floor size). Drive to Merv, which is just half an hour’s drive from the modern city of Mary and now a UNESCO world heritage listed site. Merv is the oldest and best preserved ancient oasis city along the Silk Road, and at one point during the 12th Century was possibly even the largest city in the world. Spend the morning exploring the shrines, temples, towers, city walls, fortresses, castles and mausoleums, the most notable of which is that of Sultan Sandzhar Dar-al-Akhir which reaches forty metres into the sky, topped by an almost completely intact brick dome. 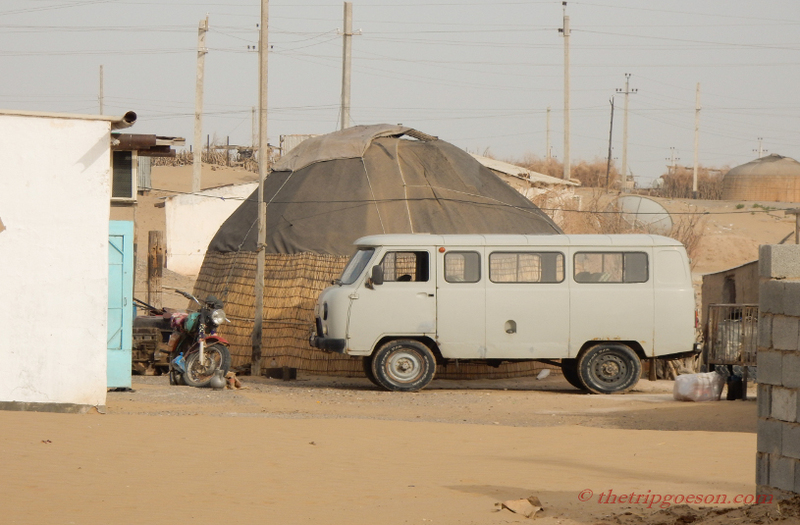 Leaving Merv, drive towards Turkmenabat, stopping along the way to admire and take photos of the Karakum Desert. Drive into the Koytendag mountains. Stop along the way at Astana Baba mausoleum, Alamberdar mausoleum. Stop in the small town of Atamyrat, where we’ll have lunch at a local chaykhana. More than likely you’ll be spotted by some locals who’ve never seen a tourist before and end up with some good company over lunch. Spend the night at a lodge in Kugitang. Continue exploring the Koytendag mountains, climbing through gorges, swimming in waterfalls and most excitingly – get a goat massage. Cross Amudarya river and drive along Kugitang mountains. Return to the lodge in Kugitang. Walk up onto the Dinosaur Plateau, the largest repository of dinosaur footprints in the world. Discovered in 1980, the limestone slab that sits at a 20 degree angle on the side of the mountain, is covered in pre-historic footprints ranging from 20-70cm in size. Although scientifically explained as this, one local legend tells us that the plateau was a place where white elephants gathered to perform sacred dances, and another tells us that the footprints are those of battle elephants brought by Alexander the Great. Continue on to Kyrk Gyz Cave. This cave is covered in a peculiar layer of stalactites, which are in fact cloth rags dangling from the ceiling. Legend has it that anyone who can fling a mud pie with a cloth attached to it, and make it stick, will have a wish come true. Fly back to Ashgabat and spend the night at the Ak Altyn Hotel. Airport transfers according to flight times. Walking up the mountain range dividing Turkmenistan from Uzbekistan and Afghanistan, and discovering the largest repository of dinosaur footprints in the world. Bend over and take it from a goat. Well how else would you get a goat massage? One of the most unique experiences we've come across, you literally bend over and a goat jumps onto your back and walks around in circles giving you a massage.